Research in yoga in both studio and school settings is beginning to show measurable benefits for kids. “Children who practice yoga may not only be better able to regulate their emotions, manage stress and calm themselves, studies now show that they may also choose better foods to eat and engage in more physical activity than children who do not,” writes Mira Binzen in her article Yoga for Children–Now Proven Effective! 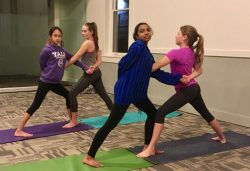 Yoga class encourages children and teens to move creatively in a non-competitive environment while honoring each student’s unique expression of the poses. Breathing Space classes incorporate age-appropriate poses, breathing, movement and mindfulness games, concentration and focus techniques, and relaxation. Classes often revolve around a philosophical or natural theme and sometimes include discussion, art, or journaling. See also: Family Yoga, which is structured like a kids class with more of an emphasis on partner poses that parents and children can do together. All our Early Childhood Yoga (0-4 yrs) classes are family classes. Preteens and teens are also encouraged to get involved with our program as yoga camp counselors in training (11-13 yrs) and camp staff (14+). Sometimes it simply makes more sense for yoga to come to your child. 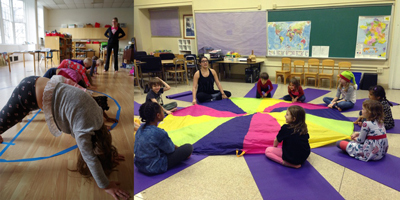 Breathing Space Family Yoga instructors are available to teach classes at your home, school, daycare or other venue. We do one-time events, such as birthday parties, as well as ongoing classes. Find out more. Homeschooler classes might be on our public schedule, so anyone can register, or for a private homeschool group, at their venue or one we organize.